This week I’ve decided to do a quick 5-day detox for good health. The rules: No meat, animal products (dairy, eggs, etc. ), processed foods, refined grains, sugars or sweeteners, bread, and the list goes on. Day one was a snap thanks to this delicious soup I made for tonight’s dinner and to enjoy throughout the week. 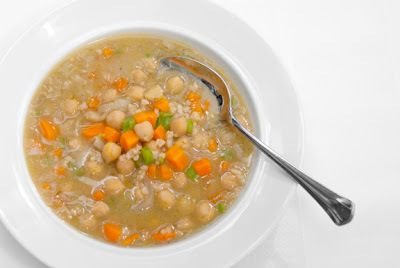 The broth is enriched with slowly simmered chickpeas and brown rice, and is so thick and rich I promise you won’t miss the meat. Rinse the chickpeas in cold water. Soak overnight at room temperature covered in water. Rinse and drain the soaked chickpeas. Add the drained chickpeas and 4 quarts of water to a large pot. Bring to a simmer over medium heat. Maintain a very low simmer covered for one hour. Add the brown rice and bouillon to the chickpeas and simmer for an additional hour. Allow to cool and store in an airtight container overnight in the refrigerator. Heat a large pot over medium heat. Add the olive oil, carrots, celery, and onion to the pot. Season with salt and pepper. Saute until the vegetables are tender and are just beginning to brown, about 15 minutes. Add yesterday’s chickpea-rice-broth mixture to the pot and some additional water if the soup looks too thick. Bring to a boil and simmer for five minutes. Season with additional salt if necessary. Serve and enjoy!